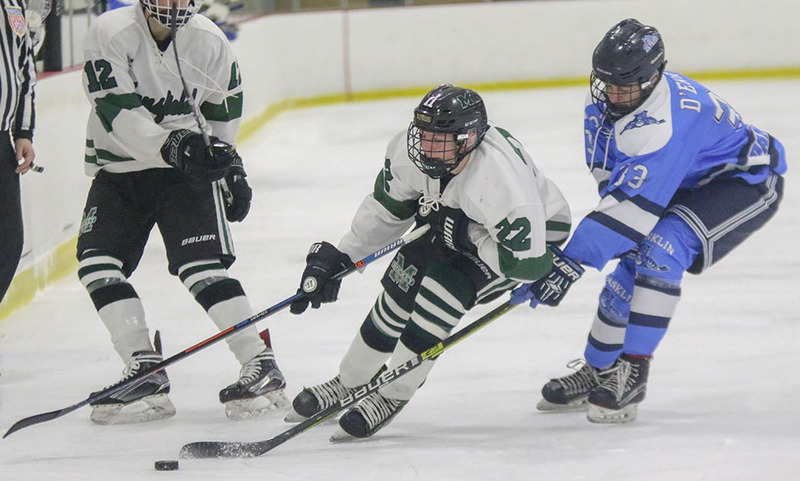 Via HockomockSports, we share the results of the FHS sports action that did manage to happen despite the weather on Monday, Jan 21, 2019. Among the several schedule adjustments, the Davey Frosh/Soph Track meet at Wheaton was canceled and will not be rescheduled. – Ali Brigham secured the win and a season sweep of Holy Name, scoring the game-winning basket with just one second remaining on the clock. Brigham scored 23 points on the night. "It wasn’t the wide open, free flowing game that some expected, but it was still a hard fought game between rivals Franklin and Mansfield that resulted in a tie that left both sides satisfied with a point. Franklin had a pair of one-goal leads in the game but Mansfield was able to respond each time, the game-tying goal coming early in the final period after the Hornets entered the frame facing a one-goal deficit." Mansfield’s Brian Grant attempts to get past Franklin’ Matt D’Errico in the second period.